Skidmarx have chosen a British motorcycle to show off their latest range of UK-made accessories at Motorcycle Live. Best known for their racing screens (the Rapid Solicitors Kawasaki of British Superbike champion Shane ‘Shakey’ Byrne was fitted with a Skidmarx screen) Skidmarx also produce an extensive range of products for road bikes. 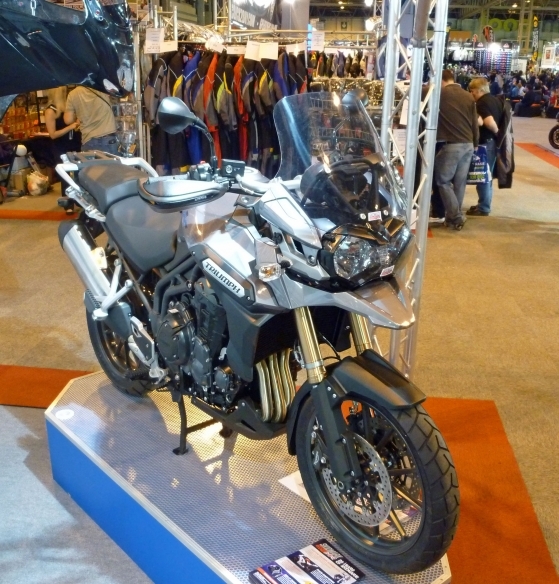 The Triumph Tiger Explorer displayed at Motorcycle Live is fitted with the new Sport screen from Skidmarx. Customer feedback suggests that, whereas most touring bikes benefit from a taller screen, comfort on the 1200cc Triumph is improved by a shorter version. Manufactured from 3mm acrylic and 10cm lower than the standard item, the Sport Screen is available in clear or tints for £59.95 including VAT. Skidmarx also produce a matching headlight cover, which sells for £22.45 and is supplied with 3M Dual Lock fixing pads. For riders who prefer a taller screen there is a 10cm higher version. Fitting an Extenda fender lengthens the rear section of the front mudguard, protecting the exposed engine, radiator and exhaust areas from road grime. Designed specifically for the 1200cc Tiger and supplied with adhesive gasket strip and screw fittings, the Extenda fender retails at £18.95. Bringing up the rear, the Skidmarx hugger is tailor made for the big Triumph and is designed to protect the rear shock from dirt and spray thrown up by the tyre. Produced in a choice of GRP glass fibre in a high quality gloss black finish or ultra-light carbon fibre, both versions come complete with fitting kit and mount from existing points on the swing arm. The GRP hugger costs £82.95, the carbon fibre version retails at £139.95. Call 01305 780808 or visit www.skidmarx.co.uk for details.